Not smart, without owning uni.com. I am sure they would have tried to buy uni.com, but it is not fun when the shoe is on the other foot. You may use Uni.link to access the registrar. I don’t see the need to change the name. Who really cares? Its the services and support that matter. Perfect Let try this also who care about that it. Non-Domainers never heard of them. So, sure they don’t need the .com . The only people going to their site are overly aware of domain extensions. Most domainers don’t like new tlds, not sure it would be a good idea to move to one for a domain industry company. I buy and sell domains and had to find out it’s a .link extension from the comments. Sorry it’s not obvious at all. Branding fail. Or, at least the Chiron. Just another stupid name by so called leaders in this industry. My domain scoring program scored Uniregistry a 2 out of a possible 10, and “uni” didn’t even score a 1 out of 10. Verisign was right, this is one f’kd up industry. I’m still looking to sell my Sedo jet ski. Bulloney, uni means ONE, which is a great brand. I don’t think your scoring system is going to get any algo patents anytime soon. Nah one.com along with .one is a large hosting provider in Nordics and they do sell domain names too. One what? One Sedo Jet Ski? LMAO!!!! Especially one that sells the importance to a majority of end users, what do we call that IRONY, or simply IRONIC? 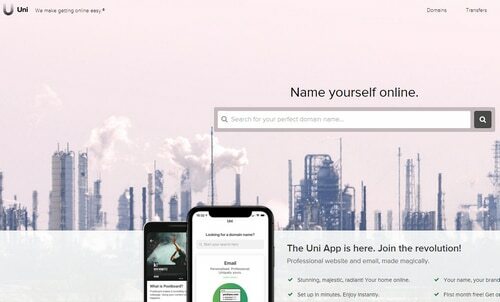 getUni.com useUni.com redirect to Uniregistry. Uniuse.com is for sale at $3,695 USD through GoDaddy Premium! …I don’t have many words for this decision just a blank stare after reading this and a slow slow blink. For those interested in naming body parts, UniHuge.com is available to hand register, and GD appraises it for $1,595. Now there’s an unforgettable name worth owning just for the fun of it…..maybe I’ll buy it after all, but I’ll give it a day. As long as Frank owns and runs the company into the ground, it does not matter what you call the company.